If you find yourself with a big old apple tree or pear tree in the garden, or maybe your neighbour has one and the fruit goes to waste, then why not make yourself some cider or perry (pear cider)? Some “experts” say use only cider apples, others mainly dessert and others mainly cooking but in reality most home cider makers use whatever apples that they have at hand, even a proportion of crab apples is fine. They don’t even need to be in perfect condition, bruised and slightly damaged apples are fine for this. If the apples have fallen from the tree, don’t be afraid to use them either, unless they’ve started to rot. If your apples still have tough skins, keep them somewhere cool for a week or two to soften. Before you extract the juice, wash off any soil or insects and then you will need to crush and press to get all the juice out. The more juice the more cider! 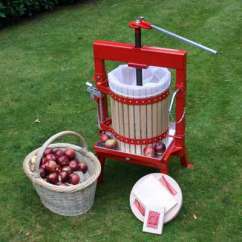 You can sit with a knife and cut up the apples and put them into a bucket, then pound with a length of wood straining the juice through folded muslin etc. A mechanical option for small quantities would be to use a juicer. There are quite a range so you’ll need to do a little online research to choose the best masticating juicer for your needs. If you’ve a large quantity then you really need to look at a crusher and press. A decent set up will last for years, so it’s worth investing in quality. 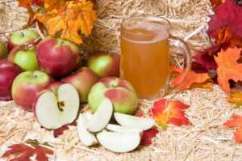 Traditional scrumpy cider would rely on the natural yeasts on the apples for the fermentation process, but that’s very hit and miss. The best way is to add one Campden tablet per gallon to kill off the wild yeasts and then add a proper wine yeast a few hours later. A Champagne yeast is ideal but a general wine yeast will suffice. You don’t need to add any yeast nutrient as a rule, but it can do no harm. Ferment in a large beer fermenter. Since your apples will vary, so will the sugar content of the juice. If there is too little sugar then the cider may not have enough alcohol to keep well. You can find this out with your hydrometer. If the specific gravity is 1070 or over, then you are OK but if it is below this, add some sugar syrup to get it up to 1070. When the cider has finished fermenting, check the specific gravity which should now be around 1005. Rack it off to get rid of the sediments and leave for a couple of days to settle further. If need be, rack it off again using finings if it won’t clear and you’re bothered about the appearance. Now you can add one Campden tablet per gallon to stop fermentation before bottling. You can use plastic fizzy drink bottles for cider or glass if you prefer. Cider has a nasty habit of restarting fermentation, so be careful with glass bottles as they can explode. Loosen the tops occasionally to release any pressure build ups. Alternatively, keep in the beer fermenter and have a party! Pear cider is made in exactly the same way as apple cider, except you’re using pears instead of apples, of course. It’s a lot easier if you let the pears wait a week or so after picking to soften. At this point they’re very easy to crush using a piece of wood and a large bucket.